The freezer is a great “holding tank” in the summer when cheap or free produce is pouring in faster than you can can it. If you are in the heat of a green bean canning session and someone comes home with a carload of blueberries, there’s no need to panic: just wash and stem the berries, and toss them as is into the freezer so you can deal with them later. And, the rest of the year, you can lighten the load on your overcrowded freezer by moving some of the stuff out and into jars. This frees up premium freezer storage space for other items that can’t be canned. Got containers of frozen stock and bags of frozen veg? Make them into home canned soup, and free up freezer room for ice cream or butter on sale! 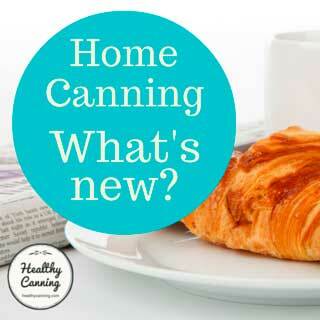 Is it crazy to consider canning frozen food? 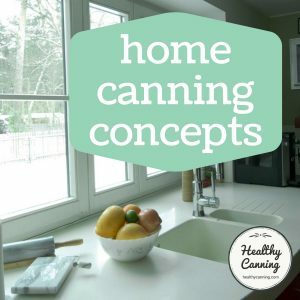 Are there any issues with canning previously-frozen food? What foods freeze then can well? 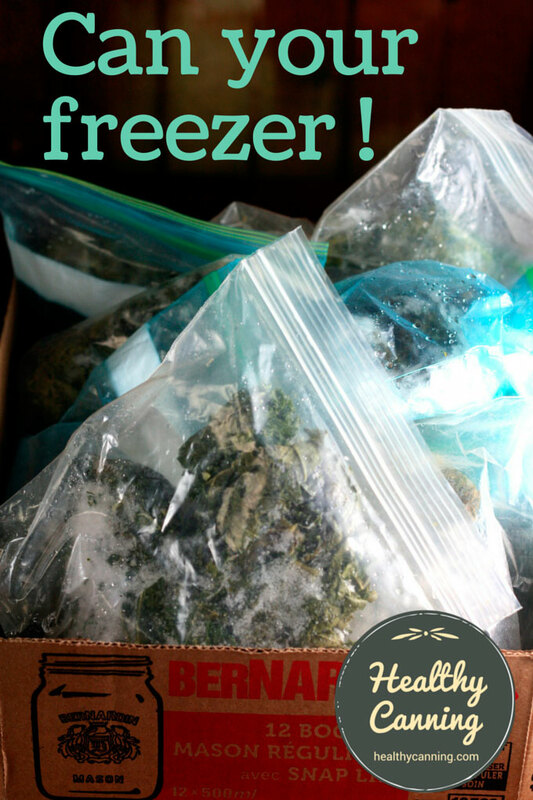 Freezing food is a very convenient way of storing food. But even with a chest freezer, freezing space is limited, and at a premium. And, there can reach a tipping point where the freezer is just so overcrowded that you can’t even begin to find stuff in there to start using it up. Various expeditions into the freezer start to find stuff from when Bill Clinton was still president. But since my freezer is filled past maximum capacity ….I decided to learn more about this new ‘back to basics’ trend.”  Fry, Rachel. A new generation is discovering the joy of canning. Logan, Utah: The Herald Journal. 10 September 2013. Accessed March 2015. It’s annoying to have a freezer so jam-packed full of stuff for long-term storage that you don’t even have a bit of freezer space as “breathing space” for temporary storage of foods, or to store some “treat” convenience items that we all like from time to time. If you do manage to keep a bit of spare freezer space, it’s super annoying when some bushels of bumper crop arrive out of the blue, that you know will eat up that spare breathing space and hog it forever and a day. 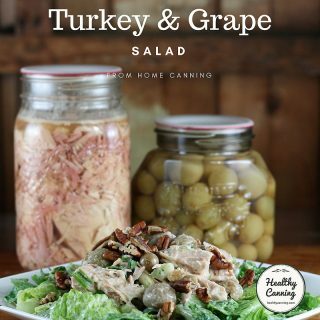 Freezing and canning can go hand in hand. 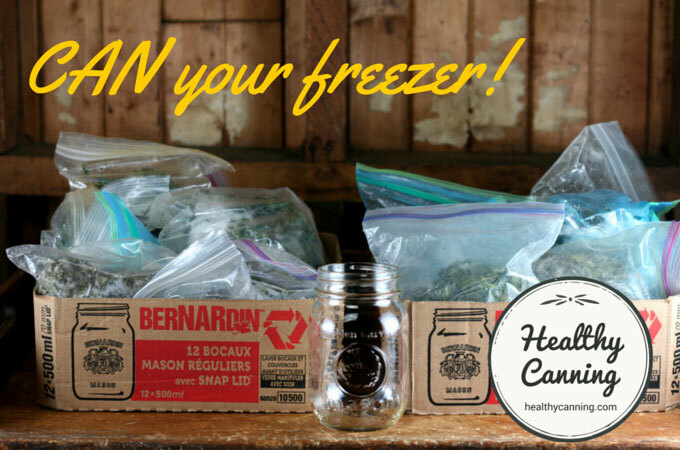 A freezer can be useful to store small amounts of a particular food until you accumulate enough of it to justify a canner run (such as ‘pick and come again’ kale.) 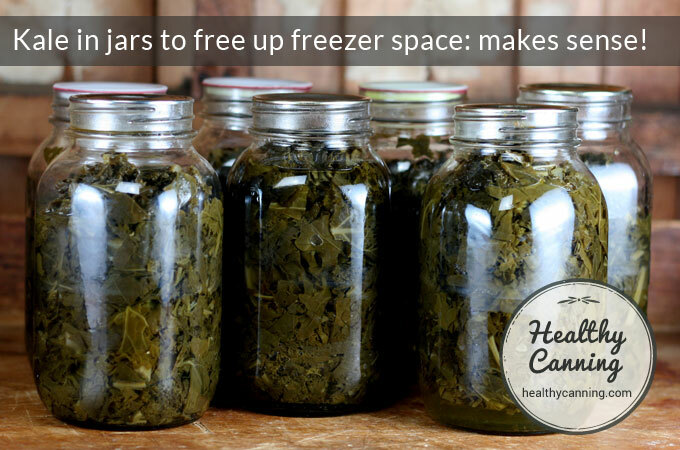 And, canning can take those long-term storage bumper crops and move them out of limited, premium freezer space into the cheaper storage space of a jar. That in turn then frees up room in the freezer for things such as broccoli and steaks, that you either can’t or don’t want to can. Plus, it’s far easier to organize, inventory and find food in nicely-labelled and ordered jars on a shelf than it is heaped up in opaque freezer bags and containers in a jam-packed freezer. 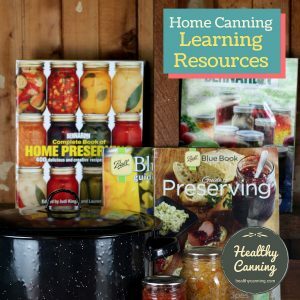 One of the biggest complaints home canners have about some “preserving” books is that after they buy them, they find the books are two-thirds full of freezing and refrigerating recipes. And they wail in exasperation that their goal as canners is actually to free some space in the darn fridge and freezer, not add to the stuff in there. If you’ve gone to the work of freezing something, it usually doesn’t make any sense to go to the added work of then canning it. But, there are times when freezer loads just get so out of control with a particular food item and for such a long time, that you want it the heck out of your freezer once and for all. That is when some people take the food item out, and can it, to free up the premium freezer space for other items which truly need it. And, many times during the harvest season, particularly with berries, it can make sense to dry-pack freeze them until you have time to turn them into jam, etc. 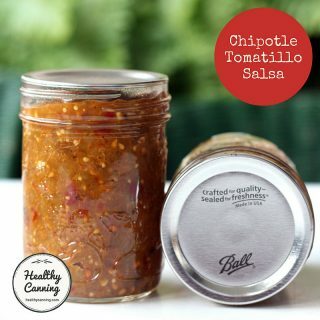 Just remember, you can only do this with stuff that there is a canning recommendation for. 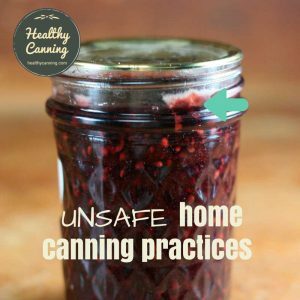 There is no safety issue in canning food that was previously frozen. 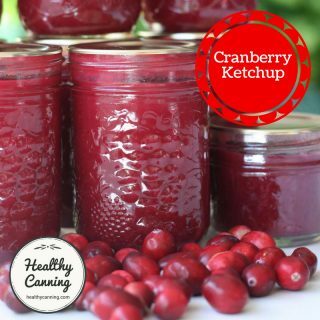 Foods that are thawed and canned must be fully thawed before canning to ensure that no cold spots exist, and the produce must be treated as fresh in terms of canning methods and full complete processing times; no shortcuts are allowed just because it “was frozen.” And for it to be canned, there must be a defined USDA / NCHFP canning protocol for it — again, no free passes because it was frozen. Low-acid foods must be pressure canned, as per normal. There could be “food quality” issues, though. The quality issues are that the food could be undesirable texture-wise — for instance, green beans that were blanched for freezing, then frozen, then thawed, then canned will be super soft, and unacceptable in quality to most people. As for the “shelf life” of the canned foods, some people ask if the shelf-life is shorter because the food was stored for a while in the freezer first. 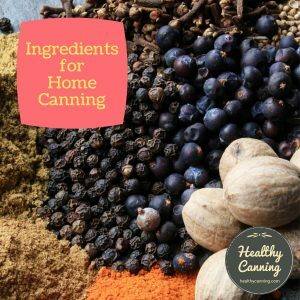 There’s no official guidance from the National Center for Home Food Preservation on shelf-life in this situation as of spring 2015, so it’s probable that the usual “one year from canning” date applies for optimal quality. Examples of food items that would likely make a successful transition from freezer to home canned jars include apples (for applesauce or butter) berries (including blueberries, raspberries, strawberries, etc), carrots, cherries, corn, fish, greens, juices, meats, mushrooms, rhubarb, peas, stocks and broths. Frozen squash would not be acceptable to can; it would be too soft to remain in the cube form required for canning. 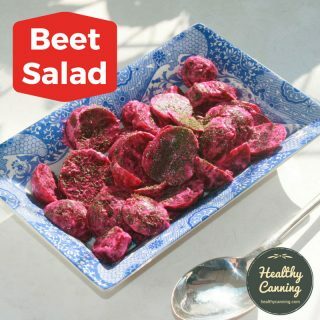 Beets that are blanched for freezing, then frozen, then thawed are acceptable for pressure-canning as plain beets. They aren’t acceptable to most people for pickled beets, though, as the texture can be too soft for that use. If using frozen hot peppers for a hot sauce, remember that while store-bought hot sauces try to impress with heat and saltiness, home-made ones are all about the taste of the peppers. Consequently, while frozen peppers still in a good state will work great, you won’t be happy using two-year old freezer burnt peppers out of the back of the freezer. Be sure to properly prepare all fruit and veg first as you would normally for freezing: wash, peel, blanch if required by the freezing recommendations. (Note: for fruit such as berries, a dry-pack freeze is best for canning later.) If you are unsure of proper freezing techniques, visit the freezing section at the National Center for Home Food Preservation. You can thaw and can meat that was previously frozen. In fact, some people even use their freezer as a temporary holding strategy, to hold a particular kind of meat until they accumulate enough of it to justify doing a canning run. You can thaw and can fish and seafood that was previously frozen. Thaw fruit and make into jellies, jams, pie fillings and chutneys. Tip: It may be best (and quickest, to boot) to dry pack your fruit unsweetened for maximum flexibility when you go to use it for canning recipes. See: Unsweetened Packs for Freezing Fruits over at the NCHFP site. When you thaw the fruit, do save all juices that come off during thaw for use as part of any liquid called for by the canning recipe. If the recipe does not call for any added liquid, add the juice in anyway. Mind you, you can only do the canning if you have a heat source other than electric on which to run the canners. 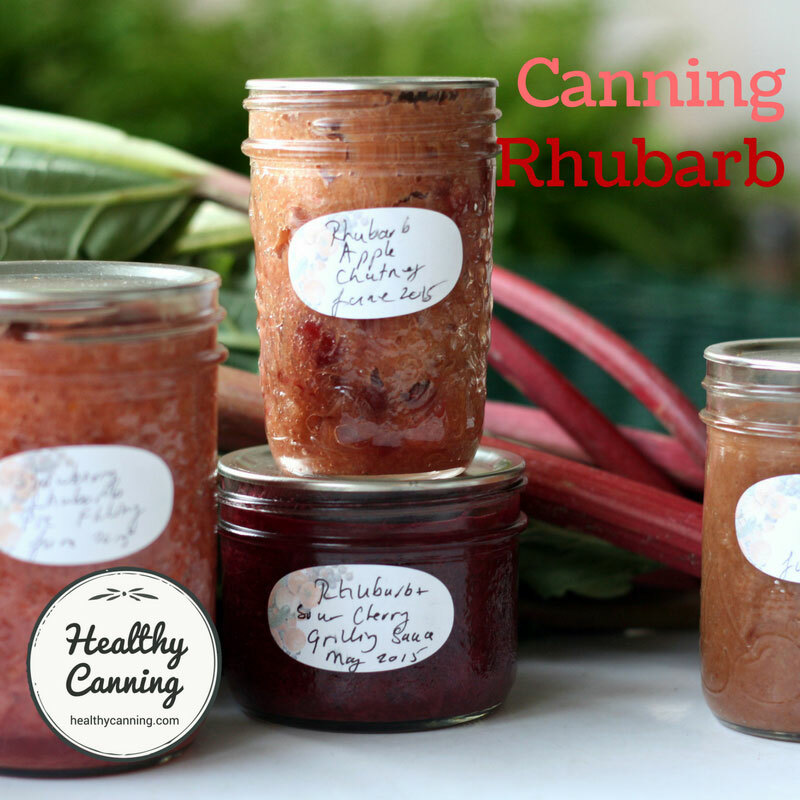 And, you can’t can everything: only food items for which there are canning recommendations. Some items won’t can well: previously frozen green beans don’t can up great. But some people say in this instance, better mushy green beans than no green beans, and at least mushy vegetables can be used in soups and stews and casseroles. On a slightly related topic, should you choose to freeze anything in jars, bear in mind that the experts recommend straight-sided jars for freezing; shouldered jars are prone to blowing up in the freezer. Unsure about the latest, best-practice advice for quality home-freezing of foods? 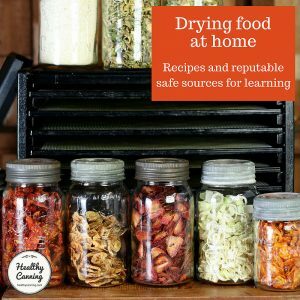 The best, most comprehensive home-freezing advice that Healthy Canning knows of as of 2016 is in So Easy to Preserve. Aside from that, a subset of that advice is available over in the freezing section at the National Center for Home Food Preservation and may be enough for a lot of people’s needs. This kale from an allotment garden was taking up an entire shelf in an upright freezer. That’s a lot of premium shelf space that could have been used instead for dairy products that were on sale. The kale was thawed, then canned exactly according to the USDA procedure for canning kale (or other greens). It didn’t need to be washed and have tough stems removed, as that had been done before freezing, of course. And it didn’t need to be steam-blanched for 5 minutes, as that had been done before freezing. It was, though, reheated in batches to piping hot before going into the jars, to replicate the hot temperature that the writers of the canning recommendations were expecting, and then pressure-canned as per usual USDA directions. BEFORE: The quantity of kale taking up an entire shelf in an upright freezer. AFTER: That entire freezer shelf of kale fit handily into just 7 x 1 litre ( US quart) jars, on a shelf, ready for use in soups and stews. And a freezer shelf was freed up for important things like ice cream, rib-eye steaks and trays of homemade pierogi. 1. ↑ Fry, Rachel. A new generation is discovering the joy of canning. Logan, Utah: The Herald Journal. 10 September 2013. Accessed March 2015. Do you have to blanched green beans for the freezer if you know you will be canning into jars within a couple of weeks. Could that possible help with the texture of the green bean not to be overly soft after being canned? My feeling is that quality-wise, I wouldn’t want to can green beans after they have been frozen. Freezing them already makes them soft as it is. Why are you freezing them first? Kale is wonderful!! I freeze it, then crush it right in the bag. If needed, let out more air and packages will take up much less room. Otherwise, the crushed kale can be dehydrated and stored in even less space. 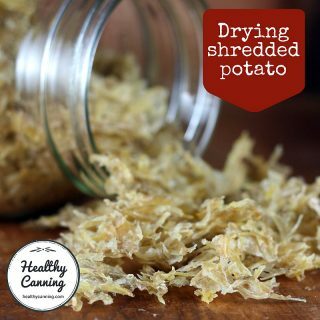 It can be thrown by the handful into soups, potatoes being mashed … lots of uses. My children love having crushed, dehydrated kale shaken onto their food … any food. They call it kale fairy dust, and we go through lots of it. This was a very interesting post and helpful! I’m new to canning. I know it’s fine to can jams with frozen fruits. However, I wanted to know if I can safely can peach salsa with frozen peaches? We had plenty of peaches from our tree that we ended up freezing. They were sliced with the peels on, my husband put them in freezer bags like that. Now the frozen peaches are sticking together. How do I measure in cups while they’re still frozen? There’s a peach salsa recipe in one of my canning books that I want to try and I need to measure a few cups of chopped peaches. What if the recipe say to weigh the fruit, do you weigh with the juices as they thaw? Can I also make and can salsa with frozen tomatoes? Thank you for your time! 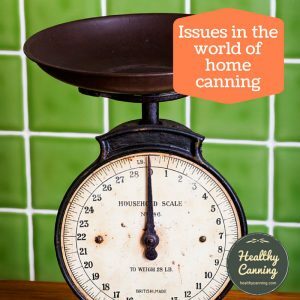 Hi Priscilla, the experts say there is no safety concern in canning with frozen food: just make sure to fully thaw it first, then proceed with canning directions. A few recipes, such as the USDA’s pie fillings, even give special mention on using frozen fruits. All canning recipes for peaches do call though for the peel off (and the experts do say, get the peel off, as that is where most bacteria is on produce.) So you’d have to pick the peel off the peaches — the peel should come off easily from a frozen peach. Weighing frozen fruit is easiest and best done before it thaws. If you do weigh it after it thaws, weigh it with the juice — as that would have been part of the fresh weight. Frozen peach slices should be easy to chop and then measure while still frozen in cups. If rock hard, let soften a bit on the counter then chop. Thank you very much for the detailed information! I’m going to check out the links. I plan on peeling the peaches. I also grow an organic garden mostly from seeds and only buy organic produce. I knew about the peaches turning brown. I wasn’t home when my husband packed bags of them in the deep freezer without lemon juice. I knew they would turn brown without ascorbic acid. Next year we’re deifnitely going to add that to the peaches. My peach salsa and jam will probably have a brown tint? I wish I can prevent that while the peaches thaw. We have San Marzano tomatoes from the garden, I have a big basket of tomatoes on the counter that I might freeze before they go bad if I can’t find time to can tomato sauce. We have a toddler and baby keeping me busy! 🙂 I started canning 3 years ago, not that much and I didn’t can last year so I’m still learning. I read a lot and have many canning books. Do you think next time, I should weigh the fruit first following a recipe that I plan on using for jams, salsa, sauce and pies before freezing in bags to make it easier? Can I use them when they thaw with the juices without having to weigh since they were measured before freezing? In addition, according to research I found out that it’s better to add sugar to the fruit while thawing for canning jams. What are your thoughts on that? I like Pomona’s Pectin for jams that require pectin because I like them with less sugar. I appreciate your help. 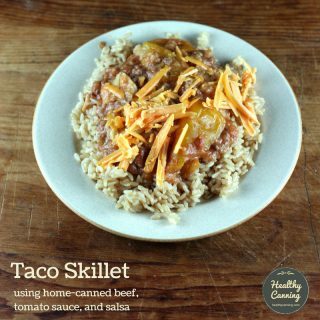 If you don’t have time to make sauce, and don’t want to give up all that freezer space can those tomatoes as crushed tomato perhaps as that can be much faster than sauce to do?